The 44th Annual Holiday High School Boys Basketball Tournament tipped off on Monday night at Bellevue College as eight teams vie for the title. The second of four games slated would match Monroe of 4A Wesco and 1A Emerald City league squad Bear Creek. The winner would advance to face King’s in the second round whereas the team that fell in this contest would take on Hazen in the consolation bracket. Monroe wasted no time getting on the scoreboard as the opening tip was advanced up the floor and converted to an easy layup in the opening seconds. The Grizzlies were not fazed by the quick basket as they strung together some offense primarily through Jonny Magee and Jordan Block. The pair accounted for 19 of BC’s 22 first half points. Coach Tyson Horner’s Bearcats grew stronger as the first half rolled along, especially after freshman Colby Kyle threw down a dunk after a steal on the defensive end. This propelled Monroe to taking a 26-19 lead midway through the second quarter prompting Coach Tyler Mendezona to call a Grizzlies timeout after his team’s confidence started to wane. At the break, the Bearcats accumulated a double digit lead as the scoreboard read 33-22. The third quarter began with a three-point spree as Monroe’s Rhen Shore and BC’s Block heated up from beyond the arc. However, trading buckets did not change the Bearcats lead heading into the final quarter. The Grizzlies needed a major run, but the call was not answered. There was a chance to cut the deficit to single digits midway through the fourth, but BC could not quite muster a late rally as the Bearcats locked up a 16 point victory. Day one of the 2014 Christmas Classic presented by Oberto matched up 3A SPSL representative in Auburn-Mountainview and Yelm of the 4A Narrows. Advancement to the second round in the winner’s bracket was on the line as the team that prevailed will take on the winner of the Kennedy Catholic/Cascade Christian game which would follow this one. The intriguing matchup in this game would be how the dynamic guards of AM in Victor Daggs and Ryan Lacey would fill the scoresheet against versatile forward Christian Davis of the Tornados. The Lions captured an early lead in the game as 5 players scored in the opening quarter. Conversely, Yelm could not buy a bucket to start the game as their first points came nearly five minutes into the game. The scoring drought ceased quickly as Davis sparked a second quarter Yelm run. The 6’4 junior tallied 15 points in the second quarter as part of his game-high 27 points which helped the Tornados chip away at the early deficit they dug themselves into. On the other end of the floor AMHS’ Lacey notched nine of his own to maintain a five point lead heading into halftime. With a scoreboard reading 38-33 into the break, this game was shaping up for an exciting finish. Auburn-Mountainview’s head coach Thomas Ostrander appeared to address his team’s size advantage during halftime as his 6’10 center Tristan Miguel played a major role in the pivotal third quarter. His rebounding on both sides of the floor led to second chances on offense and limiting Yelm’s time of possession. Miguel had 7 big points in the third which the Lions went on an 11-6 run in just under 5 minutes. However, early foul troubles by the Lions helped Yelm enter the double bonus with over 2 minutes remaining in the third quarter. At the third quarter buzzer, AM heaved a desperation throw from near mid-court. In a lapse of discipline, Yelm fouled the shooter giving Moutainview 3 free throws. This gave the Lions an 11 point lead heading into the fourth. That margin ballooned by an additional 14 points in the final 8 minutes as the 7 Lions scored in the fourth quarter while limiting Yelm to only 8 points. Auburn-Mountainview knocked down 17 of their 25 free throws in the contest en route to a big opening round win. 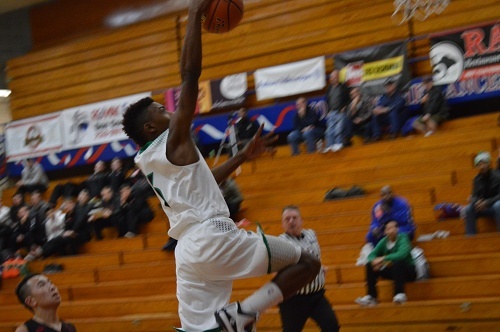 The opening round of the 2014 Oberto Christmas Classic at Kennedy HS featured 4A power Kentwood against Cedarcrest from the 2A class. A stark contrast between these two teams heading into the contest was team size and how it would affect the outcome of the game as the Conks are built like a football team on the hardwood. The Red Wolves are slighter in stature but have some crafty guards that do not back down. Would Cedarcrest give KW a challenge in the first round of the holiday tourney? 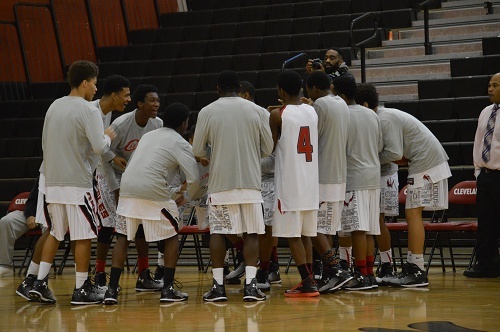 Kentwood challenged CHS from the start as they applied full-court pressure which resulted in backcourt turnovers. The Conks did not take advantage of the defensive effort early as they chose to take 3 point attempts that did not fall early. However, Cedarcrest’s early bit of momentum on offense went ice cold for the majority of the first half. After scoring only 8 first quarter points, the Red Wolves were in trouble. Preston White and Marcus Lubom both notched 10 points for the Conquerors in the first half which was more than CHS’ scoring total through quarters one and two. Nik Rearson tallied 5 for the Red Wolves as he went 5/6 from the line in the first 16 minutes. Mark Prince would hope to rally his Cedarcrest squad at the break to close the gap as the halftime score read 48-17 in favor of Kentwood. Cedarcrest was able to play a competitive second half as the lead grew by a much smaller margin than it did in the first half. They held the Conks to 15 third quarter points and were able to drain a pair of three-balls from Alex Paulsen and Robert Cha. The fourth quarter featured quality minutes for Kentwood Coach Blake Solomon’s reserves. Jordan Jones knocked down two from downtown in the final frame as Kentwood secured a 76-39 victory. There was exceptional sportsmanship displayed by Kentwood as they overmatched their opponent, but showed respect for Cedarcrest. Saturday afternoon included a contest with 3A against 4A in Cleveland and Davis. The Pirates based out of Yakima won the 4A state championship in 2012 and have regressed since that memorable run. However, some of the members of that title squad are still on the roster as upperclassmen so Davis is still a quality basketball team. Cleveland has struggled to remain competitive in the highly talented Metro League in recent years, but appear to be headed in the positive direction this season. Would Davis be able to get two wins in as many days or would Cleveland prevail on home court? The pace of this game got off to a fast start as both teams were eager to score in transition. The advantage of size in the paint for Cleveland was evident early as the Eagles rebounded well on both sides of the floor. In addition, they were able to get plenty of quality shots in the paint which translated to leading by a dozen after one quarter of play. The Pirates started to chip away at the early deficit they found themselves in primarily in the perimeter shooting of Nick Navarro. The sharpshooter buried 6 triple in the contest en route to his game-high 20 points. CJ Elleby earned a handful of trips to the free-throw line which he converted as his tenacity helped Cleveland extend their lead to 36-22 at halftime. Davis was committed to make their road-trip worthwhile as the Pirates increased their second-half intensity to cut the Eagles’ lead. The home team had some foul trouble and turned the ball over to give DHS multiple opportunities to score on offense. The lead started to dwindle and by the end of the third quarter, the difference was nine points. Cleveland’s Nico Buchanan went 6 for 6 from the charity stripe in the final frame to protect the lead. Navarro scored another pair of buckets from downtown to cut the lead to a mere 4 points. This game was still unsettled even though Cleveland led from the opening tip! However, Townsend and the Eagles closed the door by knocking down clutch buckets down the stretch as the Davis shooting starting to cool off. When the buzzer sounded, the home team picked up a quality win against a 4A team by 7 points. Quality basketball is a guarantee on a Friday night inside Crawford Court at Rainier Beach High School. The reigning 3A champs hosted the Lakeside Lions in a Metro League showdown on Friday night as some of the top talent in the state would put their talents on display. Could the Lions pull an upset on the road? 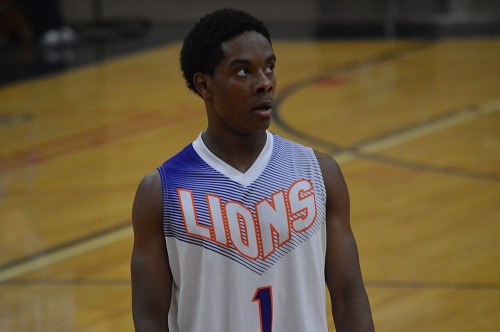 Lakeside’s dynamic guard Isiah Brown established his pivotal role on the team by scoring 13 of his team’s 18 first quarter points. Beach countered with a balanced attack of point guards Shadeed Shabazz and Ivy Smith feeding Dejounte Murray and Keith Smith. The Vikings built a five point lead after one frame, but the slim margin kept the door open for the Lions. With increased intensity on the defensive end for Lakeside, they rebounded the ball well and found points at the other end. Mid-way through the second quarter, Mike Bethea called a full timeout because the scoreboard read 27-26 Rainier Beach. The Viking responded like they are accustomed to by closing out the half on a 17-4 run. Murray and Shabazz were major contributors to the surge of points to extend the halftime score to 44-30. The Viking lead grew even more after the break as Keith Smith and Dejounte Murray knocked down some transition buckets at the cup. Ivy Smith tacked on seven in the third quarter also. Lion guard Connor Duffy provided a nice spark off the bench knocking down 10 points in the second half. 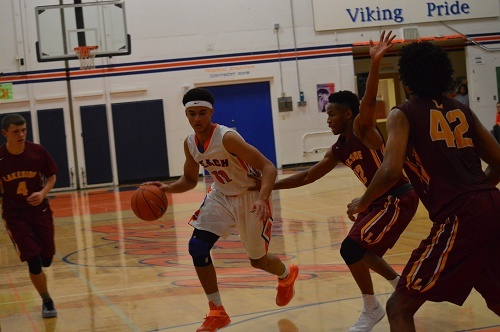 Lakeside slowly cut the Rainier Beach lead and with over 5 minutes remaining, were trailing by single digits. However, RB closed out the second half like they did the first half and kept their undefeated record intact with a 19 point victory. Tuesday night’s high school hoops schedule included a clash of two teams that were without a loss in their records. 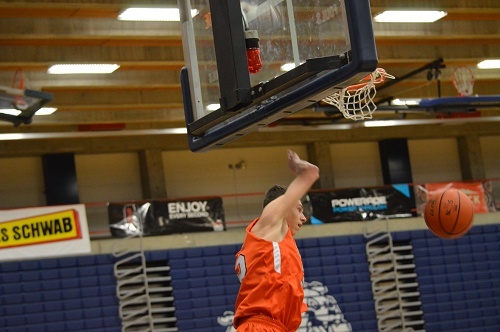 The Wolverines played host to the Totems with a chance to be perched at the top of the KingCo League standings. The home team features many of its key contributors to the state tournament last season; would Sammamish challenge one of the state’s finest? There was a high level of energy displayed in this contest as both teams were content with attacking the bucket in transition early in the shot clock. Bellevue’s zone defense established their ability to create turnovers as their length and swarming nature resulted in Sammamish headaches. However, the Wolverines were unable to convert these takeaways to points, thus keeping the Totems within striking distance. Seven Wolverines scored in the second quarter giving the home squad a 33-20 lead by halftime. The final moments of the first half were quite a spectacle as Kyle Foreman seemingly had a clear path to another Bellevue bucket. Michael Shinaul chased the Wolverine senior down and made a phenomenal block near the rim. Shinaul came crashing down into the padding behind the basket knocking it off the wall. Meanwhile, Issac Garcia raced to pick up the loose ball that was bouncing toward the Sammamish bench. He collided with an official and both tumbled to the floor into the Totem bench as the buzzer sounded. There were seemingly more players on the hardwood than standing as the first half concluded. To give themselves a chance to climb back into the game, it was imperative the Totems outscore Bellevue in the third quarter. Shaky free throw shooting by BHS was a start, but not finishing on their own possessions prevented Sammamish for cutting down the lead. 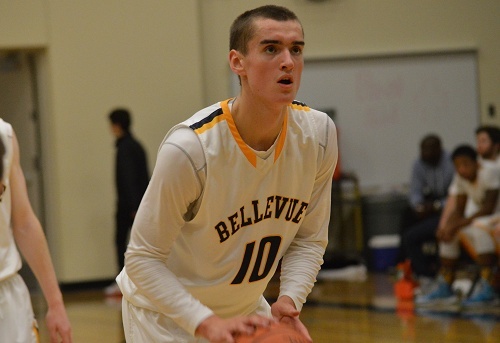 Zach Moore, Andrew Kenny, and Foreman scored four apiece in the third and while captain Vlad Yadevich netted five, the Bellevue lead grew to 19 after three quarters. The depth of the Wolverines continued to show its strength as 8 players scored in the fourth quarter as the home team picked up its fourth win by the score of 70-47. The leading scorers in the game were Gunther Klimes and Kyle Foreman of BHS and Kyle Tracy of SHS who all scored 14 points. 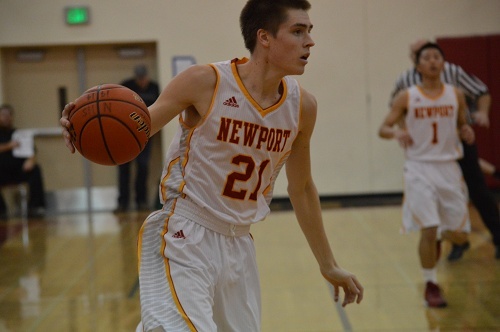 The nightcap of a full slate of basketball at Newport HS on Friday night was the boys varsity matchup of the host Knights and visiting Mustangs of Redmond High School. Newport has been a top half 4A KIngCo squad in recent years while Redmond has struggled to join the upper ranks of the conference. Would they have the horsepower to pick up the road win or would Newport pile on another win in front of the home crowd? Redmond appeared they were ready to compete as they scored the first six points of the game two of which came from a circus shot by Kevin Carpenter. Unfortunately, the ‘Stangs couldn’t keep the momentum rolling as the Knights went on a 10-0 run in response to the early deficit. The length advantage of Newport forwards started to show its presence as Ryan Kingma and Jake Higgins among others glided to the rim for layup drills. Redmond was on the brink of submitting to a big halftime deficit, but closed the second quarter strong to only trail by 5. The third quarter is where Newport put this game to rest. They limited the opposition to only 6 points in the frame while building a big lead. 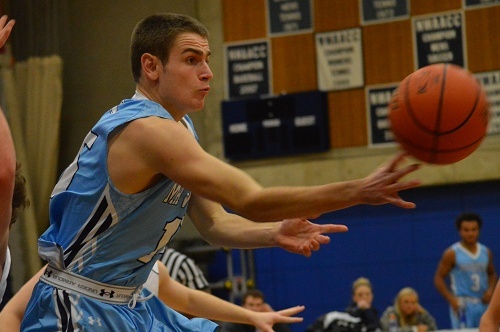 The Mustangs competed throughout the second half even as the Newport lead continued to grow. NHS head coach Steve Haizlip allowed many of his reserves to log some minutes down the stretch as his team closed out a 56-38 victory. 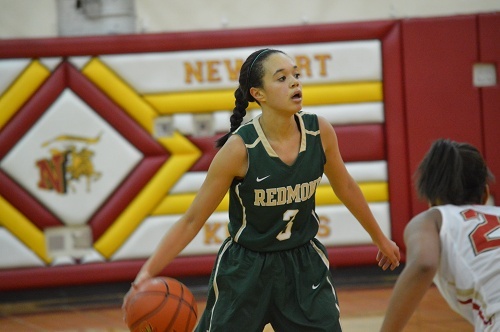 Friday night’s slate of early season basketball featured a 4A KingCo matchup of Newport and visitors Redmond. At this point of the schedule, nobody knows where they fit in the spectrum of the leagues so exciting finishes often occur and this was a glaring example. This particular contest took extra time to be settled. Who prevailed and how? The Lady Knights and their up-tempo play grabbed a 6 point first half lead as freshman point guard Jahdai Alcombrack and post Katelyn Jenkins netted nine apiece. The Mustangs had a difficult time finding a rhythm in the first 16 minutes, but kept the score close enough to give themselves a chance in the second half. Seniors Morgan Grindell and Sawyer Forseth led the Mustangs with a half dozen points each before the break by the score of 30-22 in favor of the home team. Redmond coach Ashley Graham clearly emphasized defensive pressure in the locker room because the ‘Stangs started climbing back into the game quickly. They had four scorers in the third quarter in comparison to Newport with one. They even gained the lead and held it well into the fourth quarter. Redmond was on the brink of closing the game out, but called a timeout after a defensive rebound. The only problem? They were out of timeouts! This led to two free throws that helped Newport push the game to overtime. Newport committed to attacking the rim in the overtime period and earned 11 trips to the free throw line making 8 of them. However they did not make a field goal whereas Forseth and Teagyn Ohrt made key buckets down the stretch. This was the difference in the ballgame as the road Redmond squad escaped with a 59-57 victory. The northwest tip of Washington is home to a 1B football program that seems to find its way to the Tacoma Dome every year in recent memory. 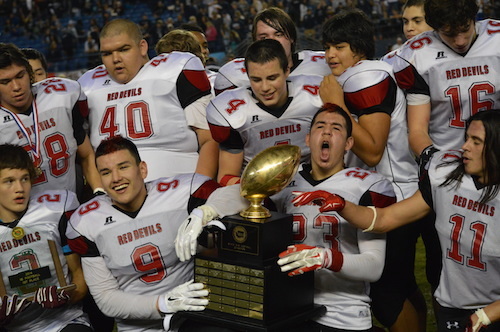 Tony McCaulley and Red Devils are back in the championship game and he visits with Steven Dion to talk about how the team has maintained success and the impact Neah Bay High School football has in the community. To repeat as state champs, Coach McCaulley will need to rally his team to defeat Liberty Christian who defeated the Red Devils in dramatic fashion for the 2012 title. He explains how that game will serve as motivation for his upperclassmen when Saturday arrives! To catch the complete radio interview with Neah Bay Coach Tony McCaulley, simply click on the PLAY BUTTON below. In his third year as head coach of the Cubs, Dave Ward has brought a middle-of-the-pack Northwest League team in 2012 to the 2A state championship game in 2014. His team will face familiar opponent Lynden who defeated the Cubs 33-30 earlier this season. The entire community of Sedro-Woolley will shut down according to Ward and get down to the Tacoma Dome via buses and trains to see their Cubs compete for a state title. He is confident in the leaders on his roster to take home the hardware from the 2014 Gridiron Classic! To catch the complete radio interview with Sedro-Woolley Coach Dave Ward, simply click on the PLAY BUTTON below. The penultimate matchup of the 2014 state championships featured a round of 8-man football from the smallest classification as 2012 winners in Liberty Christian from Richland would take on the defending champs: the Neah Bay Red Devils. Tony McCaulley has led NBHS to the championship game every year since 2011 in which the only loss was against these LC Patriots. In the week leading up to the game, Coach McCaulley said upperclassmen had extra motivation in this game to even up the score against the Pats whose victory was on the final play of the game back in ’12. Each team had an undefeated record heading into this game, whose mark would remain perfect? Neah Bay’s senior tailback scored three rushing touchdowns in the first half to give them 22 points in the first 22 minutes. Liberty Christian’s John Lesser was effective running the football in the first half as well as the junior scored two touchdowns in addition to 86 yards on the ground. A backbreaking play in this contest was John Reamer returned the ball over 90 yards after the Neah Bay defense ripped the ball out of the carrier’s hands. This play was essentially a fourteen point swing because the Patriots were on the verge of scoring. As the game wore on into the latter part of the second half, Neah Bay began to pull away and eventually secure a 56-38 win to claim their third championship in 4 years. The score between these two teams in title games is one apiece now. Will the two meet up again in the near future to settle the score? The FinalScore – Neah Bay 56, Liberty Christian 38. The Sedro-Woolley Cubs suffered one loss this season on October 24th to the defending state champion Lynden Lions. 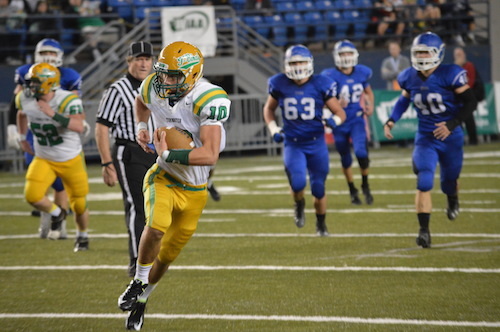 They met that same Lynden Lions club in the state finals at the Tacoma Dome, and the result was much different. A second half to remember for the Cubs, who outscored Lynden 28-7 on their way to a 42-13 route over a team that had won four of the last six 2A state titles. After Lynden scored at the end of the third quarter to close the lead to 28-13, the Cubs sidelined quieted down, knowing that their best season ever was within striking distance. The Lions then forced a turnover on Sedro-Woolley’s next drive, causing more fear in the hearts of the massive Cubs crowd. But Carter Crosby saved the day, literally. He intercepted Sterling Somers, Somers’ third interception thrown, and returned it 21 yards for a Cubs touchdown. The score propelled the lead to 35-13 early in the fourth, and the entire town of Sedro-Woolley could feel the victory. They would add another score on a Quinn Carpenter run, his second of the game, to amount the blowout win. The story of the game, however, was the Cubs defense. 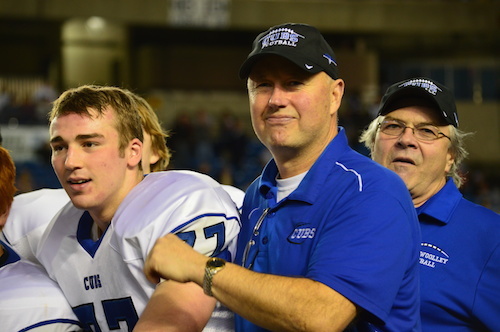 Allowing just 264 total yards and intercepting Lynden quarterbacks five times, propelled Sedro-Woolley to lifting the state championship trophy. The FinalScore – Sedro-Woolley 42, Lynden 13. 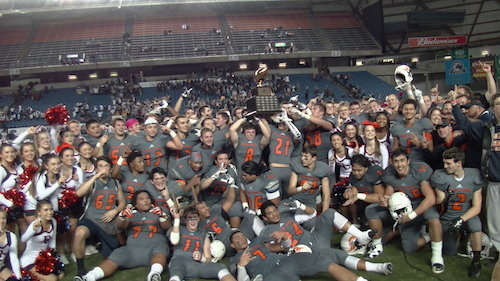 The 2014 edition of the Gridiron Classic featured the 2B championship game between Napavine and Okanogan. Northeast Washington’s representative in the Bulldogs shut out defending champions Lind-Ritzville Sprague in the semis 34-0 to earn their title game berth. The Tigers won a close contest over Toledo to get to the big dance. Luck is often an undervalued factor in sports, but the victor of this game can surely credit a few unusual bounces of the pigskin and a bend-don’t-break second half en route to a state championship. Opening drives for both teams did not yield points as the defensive units for both squads showed early aggression. The Bulldogs were facing a third and long, so Benny Cate threw toward Jimmy Townsend on the right hashmarks. However, there were two Tigers in coverage with one in position to intercept. The ball glanced off the defender’s hands to Townsend who grabbed the still airborne football for a fluky 61 yard score. Before the first frame ended, Arnulfo Tacked on a 27 yard field goal to give Okanogan an early double-digit lead. Despite the deficit, Napavine’s roster has talent which would make a comeback a likely scenario. Before the first half concluded, Okanogan tested their fortunes on another play that could have gone wrong. Cate threw a dart downfield and his receiver was scampering to the endzone, but before he got there, the ball popped loose. Payton Staggs was able to pounce on the football which was laying in the endzone for any taker. At the half, Eastern Washington was leading its Western counterpart 17-0. If Napavine were to mount a comeback in the second half, Brady Woodrum would have to continue to receive plenty of touches. Five of his 77 total rushing yards amounted to the Tigers getting on the scoreboard with over eighteen minutes of play remaining. This fired up Napavine and the momentum was shifting. Shortly after the touchdown drive, the Tigers had an opportunity to kick a field goal to cut the lead. No good. The NHS defense held and allowed for another field goal attempt. Missed. Time was running out, but Napavine still had a pulse. Wyatt Stanley connected with Mac Fagerness from 27 yard with 3 minutes remaining for a touchdown. Using timeouts wisely, the Tigers had the ball with a minute left to tie or take the lead. Okanogan was able to force a fumble on the quarterback as he about to throw the ball downfield to a receiver. Despite being shut out in the second half, Okanogan is the 2B champion by the score of 17-14. 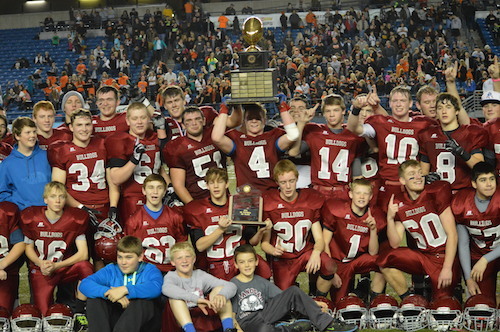 The FinalScore – Okanogan 17, Napavine 14. Since 2001, Butch Goncharoff has led Bellevue to 11 of 13 state championships including the previous six consecutive titles. Defeating the Wolverines has taken truly special teams in their era of dominance. Eastside Catholic coach Jeremy Thielbahr had his sights set on becoming the next challenger to the 3A crown and had his fair share of growing pains in the process including back-to-back defeats by Bellevue in the 2012 and 2013 championship games. The Crusaders and Wolverines steamrolled through their seasons to find themselves playing December football once again. The first two title games these teams played were blowouts in the favor of Bellevue. Everyone at the Tacoma Dome witnessed another lopsided result, but this had a different tune. Per usual, the Wolverines scored a touchdown on their opening drive, a 5 yard Sam Richmond touchdown run. Playing from behind is never a good way to start against a team approaching its 68th consecutive victory. The Crusaders managed to strike back with a 9 yard touchdown scamper by Brandon Wellington who would score twice more in the contest. Less than a minute later, Isaiah Gilchrist ran a reverse 56 yards to the house to regain the lead. The Wolverines botched the extra point which appeared to give EC a dose of confidence after conceding a big scoring play. The half would close with several read option runs by Crusader quarterback Harley Kirsch which moved the chains and set up a 6 yard strike to Hunter Bryant to give the underdogs a halftime lead. Bellevue’s commitment to the run was an unsuccessful endeavor in the second half as the Eastside defensive line grew stronger and more aggressive. Justus Rogers had three pass attempts in the game, none of which were completed. Midway through the third, Kirsch found Devon Arbis-Jackson on a short pass which he carried several defenders with him to the goal line for the score. Leading 21-13, the possibility of an upset was becoming a reality. The Wolverines ineptitude on offense was alarming as they ran only 25 offensive plays to EC’s 83 and did not convert a single third or fourth down. The total yard figures were 158 to 414 in favor of the Crusaders. Early in the fourth quarter Brandon Wellington put Eastside up by two scores on a 1 yard dive play. On the ensuing kickoff, EC recovered the football. Eleven plays later, Wellington was in the end zone again to ice the game. There was 4:18 left on the clock at this point, but leading 35-13, Eastside’s sideline was starting to realize what they had accomplished. Bellevue’s offense was stalled one final time and ECHS was able to run down the clock at their discretion. When the scoreboard read 0:00, waves of joy, shock, and disappointment were felt throughout the Tacoma Dome as Eastside Catholic defeated Bellevue in convincing fashion. Coach Goncharoff said the better team won the game and he was concerned going into the game about being undersized at the line. Winning coach Jeremy Thielbahr said they had to create an entirely new offensive scheme which Bellevue hadn’t seen them do before. The 3A crown is taking a short trip east to the Issaquah plateau for a year, and maybe more. The 2A final appears to have the best chance of becoming an instant classic. The interesting storylines heading into this game are seemingly endless. Lynden has won the last 3 titles including six of the previous 8 whereas Sedro-Woolley is in rare territory playing December football. Both teams hail from the highly competitive Northwest League that produce hotly contested games in the regular season. They squared off at Lynden on October 24th and the home team escaped with a 33-30 victory. I caught up with Dave Ward this week and he said Lynden’s ability to create a half-dozen big plays was a key factor in the first go-around and will be a point of emphasis on Saturday. Based on the quarterfinal and semifinal games, expect an enormous sea of blue in support of S-W and likewise for the Lions. The playmakers that are bound to make a splash in this contest include Sterling Somers (QB) and his favorite targets Jordan Wittenberg and Scooter Hastings who stands 6’7”. The Lynden defense has been slightly more porous than in recent years allowing opponents to push them including a rare loss against Ferndale in mid-December. The Cubs boast a dynamic offensive weapon in Mason Elms who appears to play every position on the field. If he and fellow tailback Carter Crosby can tally over 80 yards on the ground and find the end zone, the Cubs have a good shot. The strength of Sedro-Woolley is their linebacking corps. The speed and tenacity of Chad Wilburg, Jacob Farrell, and Jay Burger has the ability to hold talented offenses like Lynden, but will they put it together on Saturday to take down the champ? The action takes place on Saturday at 1pm at the Tacoma Dome. Talk about the matchup of the year in this one. The Bothell Cougars, widely regarded as the top team in 4A all season long, facing off against the defending champions, the Chiawana Riverhawks. I had the unbelievable privilege to watch the Riverhawks in the state final last year, in the best comeback in Washington state football history. Down 13 points with 1 minute to play, the Riverhawks pulled off a miracle victory over the Camas Papermakers. I have never felt so much remorse for a losing team, a team that played perfectly all season and 47 minutes in the championship game, but couldn’t close the door on a team driven by a tenacious defensive line and a quarterback with a will to win. But this is a new season, and a new team for the Riverhawks. And their competition is tested and ready for battle. The Cougars have looked unbeatable all year. Bothell quarterback Ross Conners is looking like one of the top QBs in the state, but the loss of star running back Sam McPherson may prove costly. 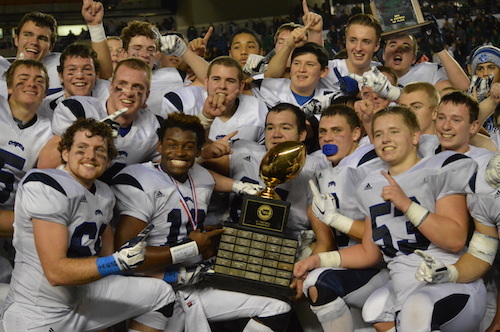 Chiawana had the best defensive line in 4A last year, and returned three of those starters last season. Look for another spectacular game and finish in this one. Chiawana has just one loss this season, to the Papermakers of Camas. 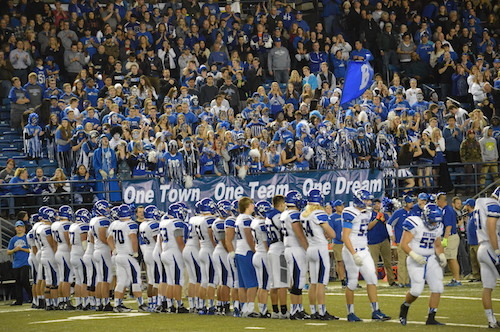 Bothell is undefeated and deservedly so, they have outscored their opponents 597-133 on the year. Who will lift the trophy in Tacoma? Come join the action on Saturday night, December 6th, at 7:30pm. The Bellevue Wolverines have won 67 straight games, a streak that goes back to 2010 when Mat Taylor’s Skyline Spartans topped them in a regular season contest. They routinely schedule games against the top teams out of state, this year against Serra (CA), and routinely pull off convincing victories. They are dominate, fast, big and strong. The Wolverines are in search of their 7th consecutive state title, and standing in their way is the Eastside Catholic Crusaders. Eastside showed their grit last year in advancing past the O’Dea Fighting Irish to the state finals, to meet the Wolverines in a 425 clash. The game wasn’t much of a contest, coinciding with the Wolverines season, and ended in a 52-20 route. This year will prove to be much closer than that. One of the states finest running backs, Brandon Wellington, is now a junior and is playing the best football of his life. Junior quarterback Harley Kirsch is also a year older, more mature, and is prepared for a matchup against one of the finest teams in the nation. The big question at hand, are the Wolverines vulnerable? 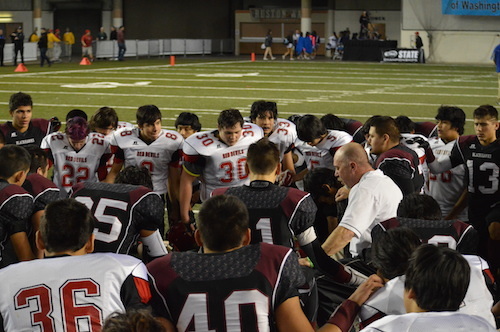 They showed hints of vulnerability last week against Marysville-Pilchuck. Can the Cru’ end the streak? I don’t think it’s in the cards just yet, but hey, it has to happen sometime, right? When taking on a Tumwater Thunderbird squad with Sid Otten at the helm, the winning-est coach in Washington state history, you know you need to bring your ‘A’ game in order to contend. Strangely enough in this game, it was the team with the fewer mistakes that was able to prevail. An unbelievable 7 turnovers in the first half, seemingly no one wanted the football, led to a 14-7 lead for the Sedro-Woolley Cubs going into the half. Finally the teams settled down, took care of the football, and we saw some of the finest high school football of the season in the second half. Sid Otten called a fake punt early in the third quarter that led to a Ian Saner touchdown run on the next play, his second of three on the day, to tie the game up at 14. But the Cubs answered quckly. A 4 play march, topped off by a Quinn Carpenter 35 yard run, put the Cubs back on top, 21-14. Ian Saner wouldn’t let it stay at that score, and punched in another touchdown late in the third to tie the game back up at 21. After a series of punts, Mason Elms, a quarterback/wide receiver/running back/wing back for the Cubs stormed down the far sideline for a 24 yard score. About the score, Elms mentioned, “I wasn’t planning on scoring.” But he did, and he put his team ahead midway through the fourth quarter. Tumwater would answer with a Griffin Shea score, but the kick missed left, and Tumwater found themselves trailing 28-17 with under 3 minutes to play. The T-birds forced a 3 and out and drove down to the Cubs 22 yard line. There they set up for a 39 yard field goal. The Cubs line broke through the Thunderbird line on the attempt, and Elijah Hill’s kick was blocked with less than 20 seconds remaining. 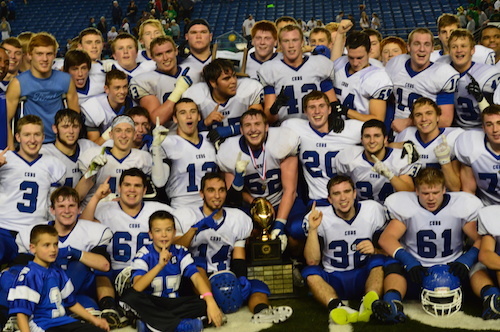 The Cubs recovered, kneeled out the clock, and advanced to the state finals. A GREAT game back and forth between two deserving teams. Congratulations to Sedro-Woolley for advancing to the Gridiron Classic. The FinalScore – Sedro-Woolley 28, Tumwater 27. Tom Bainter is one win away from a perfect season and capturing his first state title. 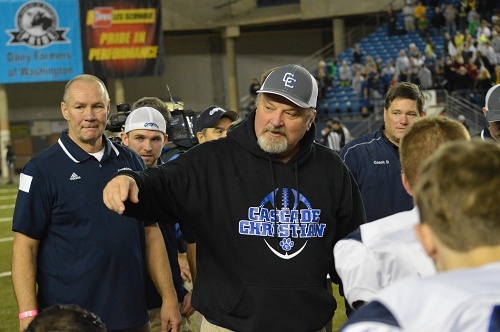 His Cougs were matched with KingCo foe Newport in the 4A semifinal at the Tacoma Dome. The Knights quietly made an impressive playoff run to reach the semis with wins over Lake Stevens and Federal Way. A big question surrounding Bothell’s ability to claim the championship is their ability to fill the shoes of star tailback Sam McPherson. The Blue Train did not appear to lose much steam in the opening rounds of the postseason, but would Newport and their complex run-game and stout line pull an upset? The Knights commitment to the run was evident early, but they coughed the ball up twice early in the contest leading to Bothell points including a 37 yard return by Jordan Baker. After conducting a blowout against Bellarmine last week, it seemed the Cougars were poised to do the same Saturday night. However, Newport put together a strong second quarter starting with a 14 play, 71 yard drive capped off with a Nick Keithley dive from the 1 yard line. After the ensuing kickoff, NHS recovered the football on a bobbled snap resulting in a Thomas Day touchdown two plays later. The lead was restored by the blue and white when Ross Bowers connected with Jackson Keimig shortly before halftime. Bothell led 20-13 with 24 minutes to play. Newport conducted a signature long drive to open the second half which was capped off with a Thomas Day highlight-reel run from 26 yards out. The Knights ran the ball on 54 of 57 plays from scrimmage. While this led to success for most of the game, it eventually led to Bothell’s ability to clamp down. Led by hard-hitting Tyler Wharf and his 8.5 tackles, Bothell’s defensive front gave their offense ample time of possession to put the game away. Dayzell Wilson hauled in a jump ball despite tight coverage and a wide open strike for 41 yards in a span of four minutes to ice the game. The Cougars will play the defending champions Chiawana next week for the 4A title. 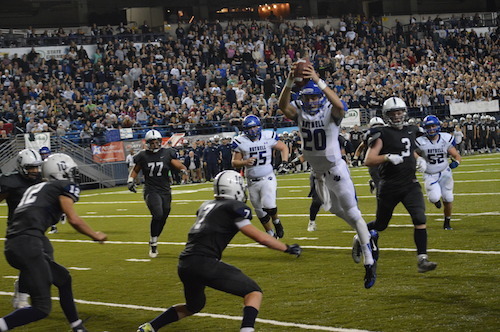 The FinalScore – Bothell 37, Newport 19. In their third matchup this season, in 8-8 football (a ton of fun, I encourage you to catch a game) the Neah Bay Red Devils faced off against the Lummi Blackhawks for a trip to the state finals. Neah Bay won both previous matchups by a 12 point margin in both games, but Lummi was looking to knock off the defending champs. Lummi started the scoring in the first quarter with an Austin Brockie 1 yard run. But it was Neah Bay’s second quarter that really changed the course of this game. Three scores for the Red Devils, one with Cole Svec’s arm and one with his legs, along with a fumble recovery gave the Red Devils an 8 point lead heading into the second half. Lummi answered in the third with a needed Hank Hoskins 2 yard run, he was great for the Blackhawks all day and had two scores in the game. But Neah Bay wore the Blackhawks out. Hoskins went down with a cramp and was gassed going into the fourth quarter. Neah Bay capitalized on a Cameron Buzzell 28 yard catch, proving to be the final score of the game. The Red Devils advanced to the state finals for the fourth season in a row! The FinalScore – Neah Bay 26, Lummi 20.